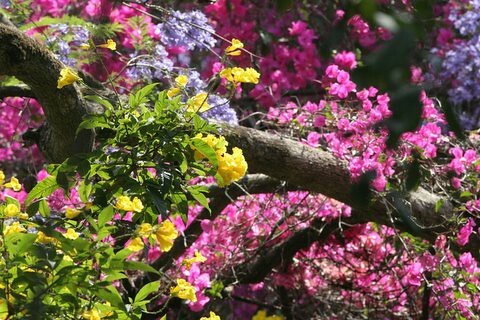 The pink-red is the Bougainvillea; the yellow is the Tabebuia; and the purple is the Jacaranda…and the green is…most welcome! Any wonder that Spring is the time when Holi, the festival of colours, is played? A great weekend getaway, within easy driving distance of Bangalore, Yercaud (actually that should be written Erkad!) 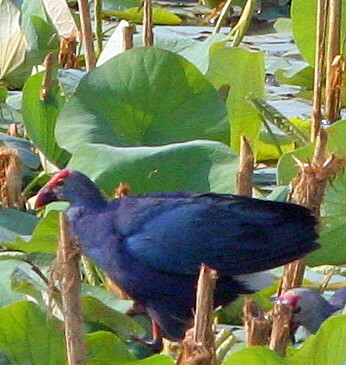 is still undeveloped and therefore, largely unspoilt. MUST go to sleep now. I took this picture on my morning walk at Yercaud, where we went last weekend. The wires speak of progress…the hen at the left-hand-side of the picture speaks of being still agricultural, and farm-based…and the number of water-pots the woman is carrying, in all their prismatic colours, still speaks of the fact that basic infrastructure is lacking in our villages, and women have a hard lot to bear. Remember that the woman will be trekking back with all those pots full of water…and that’s if it’s a good day. 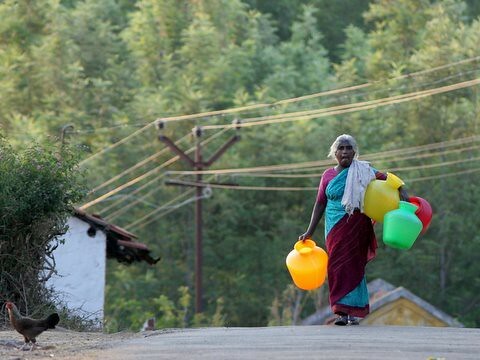 On a bad day, when there is no water, her physical load will be light but her household load will be heavy as she tries to manage without water. I have been taking some pictures but finally, KM has ALSO decided to post to INW methinks…with the result that the camera was set to CR2 (the raw format for Canon) and the CF card, of course, got quickly full! Will download the pictures, and post a few of the decent ones (birding trips to both Okhla Bird Park and Sultanpur Bird Sanctuary)…and the campus where we stayed, the Anand Farm in Gudgaon, was a beautiful place with a wealth of birds. KM has taken the CF card today…tomorrow will be my turn! Still wondering if the trip to Delhi was worth it…until I visited the home of someone I know, and found that their 13-year-old daughter writes beautifully. I tried opening a Live Journal account for her but the broadband connection in her home was down. She does nice anime sketching, too…a very creative child, I hope to introduce her in my LJ, at least, soon….. I bet I haven’t been missed….but I had a weekend at Yercaud with friends,and then 4 days in Delhi to attend a wedding,and then KM’s board meeting…. I do have some nice pictures because a. we went to Okhla Bird Park and Sultanpur Bird Sanctuary and b. the place we are staying in has an amazing variety of trees and birds…including peafowl (they strayed in naturally, apparently)….It’s been a wonderful week. The funny coincidence was taking photographs of the yellow-toed green pigeon here and finding it on sainath‘s page as well….but wait till you see my pics of various birds singing! I *am* getting better. Back to Blr tomorrow….chores waiting, preparations to be made…. A very enjoyable set of questions…. I promise, if you don’t get even a smile up for that, I will pay you the sum of a million dollars….NOT, as beast_666 would say! 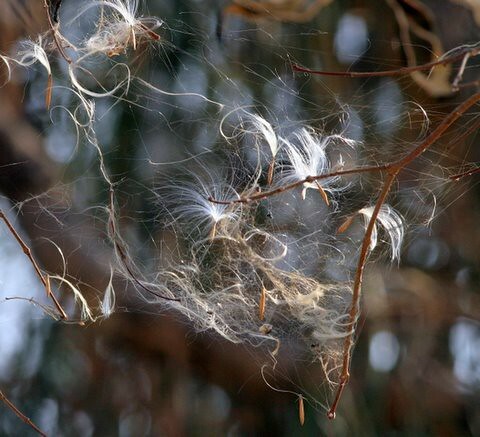 But leave aside the medicinal part..the burst seed pods look so lovely! Enjoy the picture…and I hope you never have to be sick enough to “enjoy” the derivative medication! Another sad ending… a few days ago, I came back from a trip and eagerly went to look at the coconut palm….and found no eggs in the nest or female kite, either…and over a period of time, I realize that the eggs have probably been predated (by crows?) and the female kite has abandoned the nest…. I’ve been noticing for the past decade or more, that human males seem to be evolving towards less hair on their heads. Baldness has always been around, but it was generally associated with middle to old age; but now I find, more and more, that young men, even in their mid-twenties, are either thinning or balding altogether. Could this be due to stressful lifestyles, detergent-based shampoos, or evolution? Given the increasing trend, though, it is a pity that hair is still such a “feature” of beauty, as much as in the male as in the female. In earlier times, hair was considered an aspect of beauty, so much so that widows in South India were shorn, and women in Islamic countries had to hide their hair even if their faces could be visible. But this aesthetic sense has not changed in the past few centuries…but hair patterns seem to have done so! Women with sparse hair do have a tough time competing with their fuller-head-of-hair sisters….but I notice the same sense of competition amongst males, with the more-locks men being insufferably smug sometimes. And men seem to also always keep experimenting with facial hair….every young man I know has, at some point or the other, tried out a beard, but not the traditional full one, or even the Islamic no-mustache one…they usually try out goatees, or that little triangle of hair under the lower lip that looks as if they forgot to shave it…and then, of course, the beard disappears, because, I suppose, of the discovery that maintaining a beard is not a simple matter of no shaving. I don’t however, see much differences in mustaches …no soup-strainer, Rajasthani lip-to-ear, no “hanging” ones….just regular mustaches are all that I, at least, see around me. Er…should I say “mustache” like the Americans or “moustache” like the English? is waiting for you….a vegetable, a pickle, a fruit, a dessert, a delectation, a delight, a delicacy…. 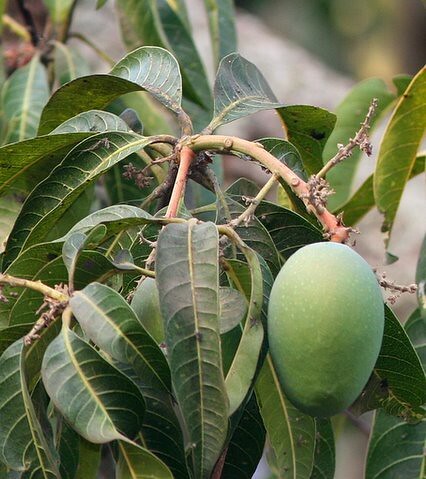 Mango is short for “Mangocrazyforthisfruit”. You are currently browsing the Deponti to the world blog archives for March, 2007.